You are here: Home / News / NATIONAL TOUR BEGINS FEBRUARY 4, 2011! NATIONAL TOUR BEGINS FEBRUARY 4, 2011! BURBANK, CA – November 3, 2010 – Disney's Emmy Award-winning Imagination Movers will kick off their "In a Big Warehouse" concert tour on February 4, 2011 in their home state of Louisiana. The wildly popular New Orleans-based rock band for kids of all ages will travel coast to coast playing their most popular songs and bringing the magic of the Imagination Movers television series' Idea Warehouse to life performing in a series of 100 shows across the nation. Concertgoers can expect special appearances from Nina, Warehouse Mouse and other characters from the TV series. The tour will visit more than 50 cities, including New York, Los Angeles, Chicago, San Francisco, Boston and Washington, D.C. Tickets for all dates will go on sale November 12 via Ticketmaster with a special pre-sale for all dates beginning online at Ticketmaster.com November 9 at 10:00 a.m. There will be VIP packages for fans available in many cities. 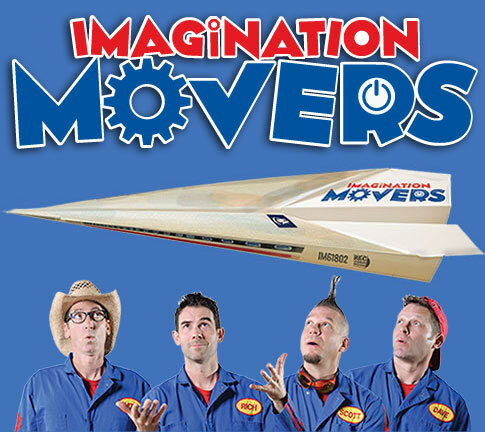 For details on the tour dates, VIP packages and venues visit www.imaginationmovers.com. The Imagination Movers television series, which features the blue-suited band as brainstormers working hard to solve “Idea Emergencies” in their Idea Warehouse, is a hit with audiences around the world, airing in over 55 countries/territories and in 12 languages since September 2008. The Movers are currently filming the third season of the series and recently filmed a concert in their hometown of New Orleans with some very special guests. Season three of the series and the concert special will air in 2011. Imagination Movers airs daily during Disney Channel's Playhouse Disney programming block for preschoolers (to be rebranded Disney Junior in early 2011). Click here for 2011 Tour dates!